Mankind’s initial survey of the Solar System will be completed this month when NASA’s New Horizons space probe arrives at Pluto. Probes have visited the 8 major planets, two dwarf planets (Ceres and Vesta), and several comets and asteroids. Pluto is one of the larger members of a distant swarm called Kuiper Belt Objects (KBO), and will be the first KBO visited. Closest approach will be on July 14, 2015. Interestingly, when New Horizons was launched on January 16, 2006, Pluto was still considered to be a “planet.” Later that same year Pluto was reclassified as a “dwarf planet” by the International Astronomical Union (IAU), a decision that is still a matter of contention in some circles. But as I explained in my September 27, 2006 post, there were several valid scientific reasons behind that decision. The image above shows the two photographic plates Clyde Tombaugh used to discover Pluto back in January of 1930. 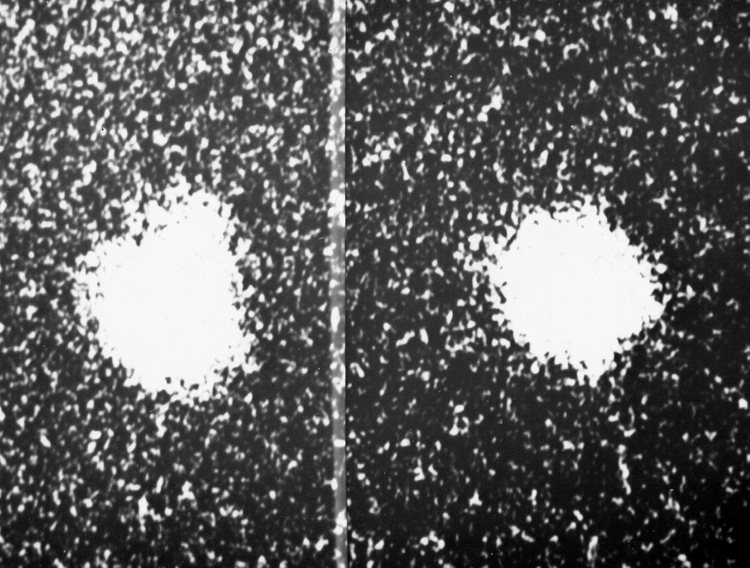 Employing the power of the 61 cm (24″) Clark refractor at Lowell Observatory in Flagstaff, AZ, Tombaugh compared two images taken about a week apart and noticed a tiny moving point of light (circled in yellow). It was only a featureless point, but since it moved relative to the stationary stars (all the other points of light), and based on its speed, it had to be a member of our Solar System. It was beyond the orbit of Neptune, then thought to be the farthest planet from the Sun, so it was dubbed the “9th planet.” Pluto was named after the Roman god of the underworld. For close to 50 years, this was the best image we had of that distant object. 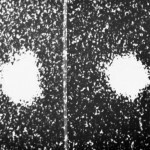 The situation improved (slightly) in 1978 when James Christy at the US Naval Observatory in Flagstaff, AZ obtained the photos shown in the thumbnail below. 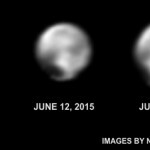 This grainy and highly magnified image includes two views of Pluto taken at different times. The left view shows a bulge around 1 o’clock that is absent in the other view. That bulge is Pluto’s largest moon, now named Charon. There’s been some disagreement about the pronunciation, as the original Greek is KARE’-ON (hard CH) but Christy pronounced it SHARE-ON’ (soft CH) with the accent on the second syllable. Some say this is an homage to Christy’s wife, whose name is Charlene. Regardless, most English speakers follow the latter pronunciation. 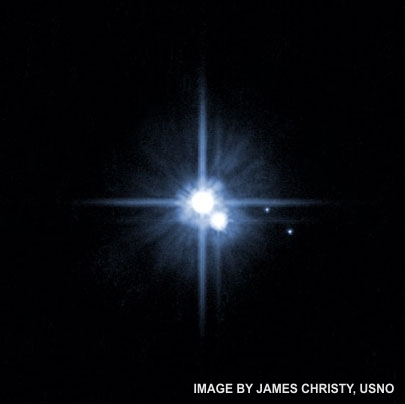 The next big improvement in our view of Pluto came from the Hubble Space Telescope (HST) in 2006. The thumbnail below shows an HST image that captured Pluto and Charon as separate points, plus two additional moons. They’re all still featureless points of light, but this image provides a better sense of scale for the size of Pluto relative to its system of satellites. From left to right: Pluto, Charon, Nix, and Hydra. 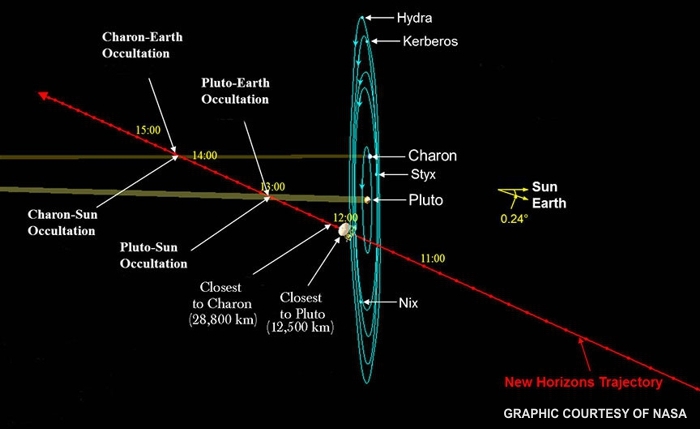 Pluto’s 4th and 5th moons have since been discovered, again by the HST: Kerberos in 2011 and Styx in 2012. 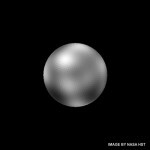 Even with the most powerful Earth-based telescopes it’s difficult to see much more than a featureless point when you image Pluto. It’s around 5.8 billion km (4 billion miles) distant on average. But by using digital processing on HST images, NASA has produced a rough map of Pluto’s surface “details.” There’s some pixelation in this image, but it does confirm there are variations in reflectivity around the surface. The cause of those variations is currently unknown, but it’s likely due to uneven ice and rock distributions. The best view of surface details we have to date is from the New Horizons probe as it approached Pluto during June of 2015. The cameras on that probe aren’t nearly as powerful as the HST, but New Horizons is closing in fast. The June 5 image is from a distance of 47 million km (29 million miles), and the June 18 image is from 31 million km (19 million miles). It shows a little more resolution, but the details are still blurry. 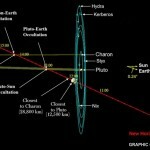 All of this will change on July 14, when New Horizons flies through the center of the Pluto system. At closest approach, it will image Pluto from a distance of only 190,000 km (118,000 miles). It will also image Pluto’s moons. The thumbnail below shows the probe’s trajectory through the system, nearly perpendicular to the plane of the moons’ orbits. Images from that encounter will start coming in next week. If history is a guide, those images will raise as many questions as they answer. Stay tuned for more on this exciting mission.